Petrea Hall, Centre of Excellence, Macoya. Monilal Lalchan, Chairman, The Office of Procurement Regulation. 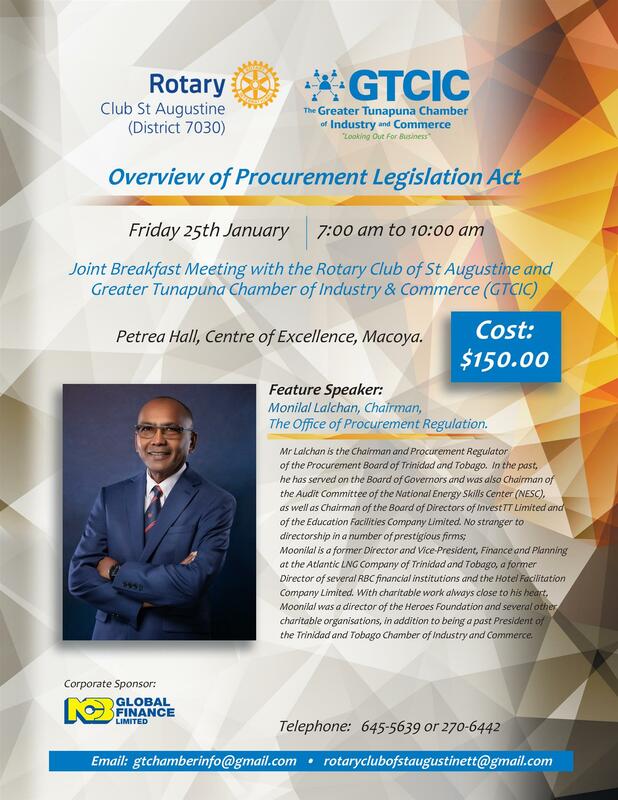 Mr Lalchan is the Chairman and Procurement Regulator of the Procurement Board of Trinidad and Tobago. In the past, he has served on the Board of Governors and was also Chairman of the Audit Committee of the National Energy Skills Center (NESC), as well as Chairman of the Board of Directors of InvestTT Limited and of the Education Facilities Company Limited. No stranger to directorship in a number of prestigious firms; Moonilal is a former Director and Vice-President, Finance and Planning at the Atlantic LNG Company of Trinidad and Tobago, a former Director of several RBC financial institutions and the Hotel Facilitation Company Limited. With charitable work always close to his heart, Moonilal was a director of the Heroes Foundation and several other charitable organisations, in addition to being a past President of the Trinidad and Tobago Chamber of Industry and Commerce.